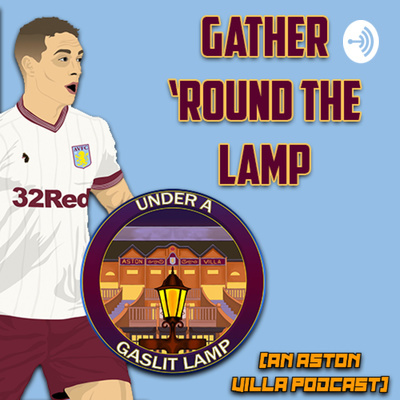 Welcome to Gather 'Round The Lamp, an Aston Villa Podcast by popular blog Under A Gaslit Lamp. We'll be talking about players, sharing our own opinions, speaking to the opposition and much more. Regan and Mark are back again to discuss the hard-fought win against Rotherham and the poor officiating that came with it, the weekend's game against Sheffield Wednesday. Other topics of discussion include player specifics and the 'making the most from mistakes' mentality the side seam to be employing. Up the Villa. Regan (@FindFoy) and Mark (@VillaMarkPGH) dissect Aston Villa's win against Blackburn last weekend and discuss the return of Steve Bruce to the forefront of Villa fans' thoughts. As well as this, there's talk about the Aston Villa Ladies' continued unbeaten run in 2019, the psychology of dressing rooms, the Americanisation of football and a potential old transfer link that could still come to pass. We hope you enjoy, and if you do, please subscribe/follow and give us a rating! P.S - We're currently in the running to win a national award, 'Best New Content Creator' at the Football Blogging Awards. If you've got a second to spare, please visit us on twitter @UnderAGaslitLamp and take a look at our pinned tweet. Regan (@FindFoy) sits down with Thomas from @Rovers_Chat to discuss the upcoming game against Blackburn Rovers, concentrating on the form of both sides, standout players and more. We'd like to apologise in advance if any audio issues arise as previous recordings had to be recovered after corrupting. Regan (@FindFoy) is joined by Mark (@VillaMarkPGH) and Cole (@TalkAstonVilla) as they discuss the rich form Aston Villa find themselves in as we move into the international break, as well as highlighting some of the key players that have got us into this position. Other topics of discussion include the Aston Villa Ladies and their SSE Women's FA Cup upset, Jed Steer's new contract, and Jack Grealish's chances of an England call up. @FindFoy and @VillaMarkPGH delve into what made Jack Grealish go from zero to hero, the influence of Gabby Agbonlahor on his career so far and how their careers are similar, and speak about how Grealish has performed since returning from his injury which saw him miss thirteen games of the Sky Bet Championship season.